This user friendly audio converter will convert MP3, WAV, WMA, CDA & OGG files with just a right click! It seamlessly integrates into Windows and is always accessible without having to bring up a clunky, screen-hogging interface. It has a high quality 32 bit converter engine that makes pro quality conversions to and from the most common audio formats. An integrated audio CD ripper is also included! Just right click on a CD track and rip or convert it to WAV, MP3, OGG or WMA file! Professionals will find this tool indispensable. 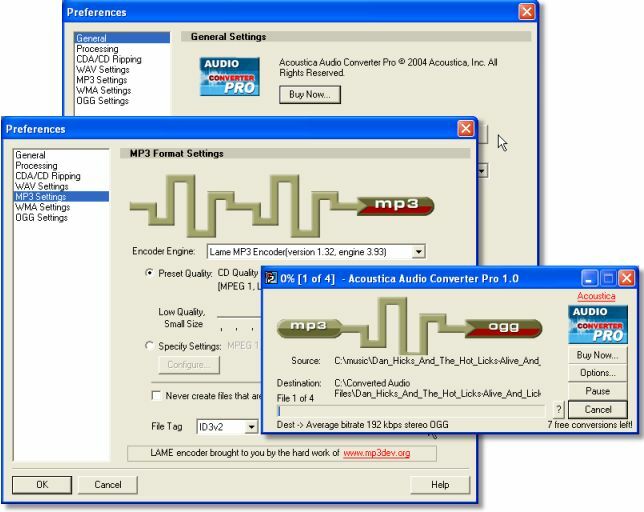 Home hobbyists will find Audio Converter Pro a very handy addition to their arsenal of audio tools. * Simple to use - right click on a file and select "Convert To"
* Convert entire folders and sub-folders with a single right click! Very handy for changing the format of your entire audio library. * Rip audio CDs with a right click. Automatically looks up track info and names the converted tracks. * Removes silence from the beginning and end of the sounds.